Enjoy a heartburn-friendly taco… for breakfast! These don’t contain a single heartburn trigger—no spicy jalapeños, chili pepper, paprika, BBQ sauce, garlic, onions, or acidic lime juice. However, you’ll still get the traditional Mexican flare from spices like cumin and coriander, corn tortillas, and lime zest. Preheat oven to 350F and line a small baking sheet with parchment paper. In a small bowl, mix the sweet potatoes and carrots with olive oil, cumin, coriander, salt, and lime zest. Transfer to the baking sheet and roast for 15 minutes. Once the vegetables are ready, spread the mashed black beans on the tortilla and top with the veggies. See the serving tips below for additional topping suggestions. Swap in your favorite root vegetables if you’re not a fan of carrots and sweet potatoes—turnips, parsnips, rutabaga, radishes, and kohlrabi are good choices that won’t trigger heartburn. You can also use a different kind of bean if you don’t have the black variety handy. The roasted vegetables explode with flavor, so you can easily enjoy these breakfast tacos without anything added. They’ll feel more like breakfast topped with an egg or lime-zested yogurt though. You can add a fried egg, cooked in half a teaspoon of olive oil, and sprinkle with a little bit of lime zest for an additional 90 calories. Alternatively, top with 2 tablespoons plain low-fat yogurt mixed with zest from half a lime for an additional 35 calories. You can serve these tacos traditionally, with a double tortilla, but it’s important to keep portions in check when you have heartburn. Larger meals tend to increase abdominal pressure and force acid past the barrier between your stomach and esophagus. If you think you’ll feel full with a single tortilla layer, stick to that. 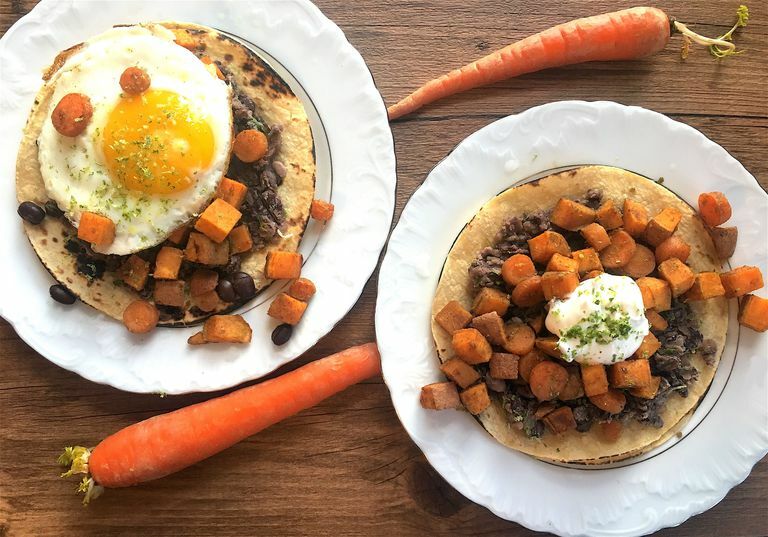 To save time in the morning, prepare the veggies and black bean mash the night before and simply assemble your taco in the morning.